Jenson Button’s arrival into Super GT has been met with a steep learning curve, with the 2009 Formula 1 world champion still adjusting to the Japan-based championship and a vastly different culture, according to his chief engineer Hitoshi Iyoki. The Briton, who made his Super GT debut in last year’s Suzuka 1000km, is set for his first full season in GT500 competition in a Raybrig Honda NSX-GT alongside former Super Formula champion Naoki Yamamoto. Button has so far completed a pair of pre-season tests at Okayama and Fuji Speedway earlier this month, where key evaluations, such as tire choice and car setup, were performed. The first day of the test in Okayama, site of next month’s season-opener, was entrusted entirely to Button, who logged four hours in the car and ending the day sixth quickest. “While the team had some hardships communicating with JB, I think it was JB who seemed to have been worrying more than anyone else,” Iyoki told AUTOSPORT web. The Okayama test provided Button his first opportunity to drive the Honda on a tight and twisty circuit, after outings on wide-open circuits such as Sepang, Suzuka and Fuji. Furthermore, most of the previous sessions had been private tests, without traffic from GT300 class machinery. According to Iyoki, the team worked to address Button’s concerns, including communication, at the recent test. “Let’s give JB’s way a chance first, and we may be able to find what needs to be modified in our program. That’s how we proceeded,” he said. 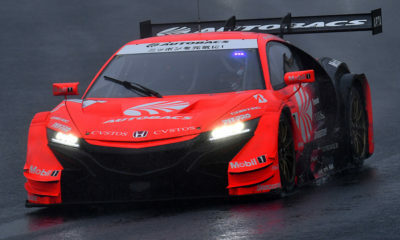 Honda’s GT project leader Masahiro Saeki has given Button high praise, in being able to quickly adapt to his new environment. Button’s co-driver, meanwhile, set the second fastest lap on day two of the test, with no setup adjustments made to the car. “He must have been relieved understanding that he can use JB’s setup,” Iyoki said. “The team shared that the machine is going in the right direction. Above all it was JB who must have reassured. “Despite appearances, JB is such a shy guy. He’s not the type of person who strongly pushes himself and that was putting him into a bit of conservative mindset. “In that sense, the test was a big progress for us all in terms of establishing better mutual communications. Iyoki has also spoken highly of the 38-year-old’s demeanor in and out of the cockpit. “He seems to treat his fans well, creating the mood of a gentleman, a star,” he said. “Once he sits behind the wheel he turns into such an earnest driver. Extremely earnest. This time maybe it was because JB proposed us the plan himself, but either way he is never irresponsible. “He evaluates everything he’s involved in so strictly. Media were unable to reach Button for comments at the recent test as he was under strict guard from fans crowded around the Raybrig garage. Yet, he spoke to the circuit’s public address system, stating they were able to complete many different “menus” including short and long runs. “There are still many more for us to do towards the season, but we hope to be able to show our speed and capacity to the audience even from the qualifying round,” Button said.